Boy, I really stepped up here...later in 1976. 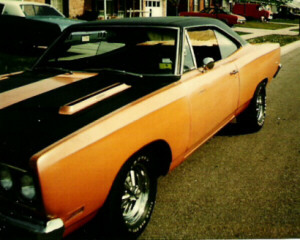 This was my first 1969 Roadrunner. It had a 383 with 440 heads and a torque flight trans. The paint was orange pearl and it had Crager SS wheels. This car was fast compared to what I was used to. In fact, I lost my license for 60 days because of this car. I was clocked doing 90 MPH in a 35 MPH zone in Germantown. The day I appeared in juvenile court I sure earned the respect of the other teens.